Kelsey Morgan ‘17: A Journey to a Career in the Humanities – Let Us LAUNCH "U" into Research! Let Us LAUNCH "U" into Research! Ms. Kelsey Morgan is from Montgomery, Texas and graduated from Texas A&M University in May 2017 with Bachelor of Arts degrees in both philosophy and English, and a minor in religious studies. Kelsey is now the Visual Communications Coordinator for Humanities Texas, a nonprofit, educational organization based in Austin, Texas. Kelsey serves the organization by managing communications through newsletters, the organization’s website, and their social media presence. 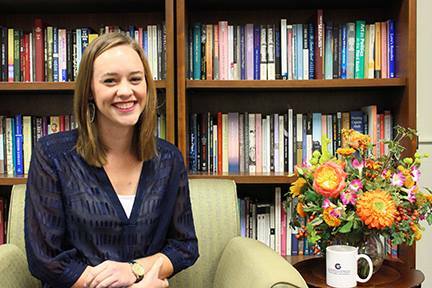 Kelsey’s current position at Humanities Texas is the result of a winding journey through changing career goals and coming to terms with her love for the humanities. Originally convinced that she wanted to be a biology major and work in a lab, Kelsey arrived at Texas A&M and decided to pursue a degree in the humanities in the hopes of becoming a pastor. She describes her relationship with the humanities saying, “I have always excelled at math and science, but have also loved literature. It captivated me in a way that science never could. I struggled with the humanities because they required me to voice my own opinions.” Influenced by her philosophy and English curricula, Kelsey began seriously considering a career in academia. She says that it was this change in her career goals that led her to participate in the Glasscock Summer Scholars Program and the Undergraduate Research Scholars (URS) Program, opportunities available through a collaboration between the Glasscock Center for Humanities Research (GCHR) and LAUNCH: Undergraduate Research, during her junior year. Kelsey’s time as an undergraduate researcher also sparked an interest in editing, as well as a desire to work in communications. “While writing my thesis, I saw a way that I could help implement the changes I was arguing for. I decided that I wanted a job in communication but still was unsure what that meant for me,” Kelsey says. Kelsey started working at the Glasscock Center for Humanities Research (GCHR), where she was given the opportunity to explore copy editing and graphic design in the context of a communications position. Like many humanities majors, Kelsey believed that she needed to go to graduate school in order to get a job with her degrees. However, looking back, Kelsey says, “My time as an Undergraduate [Research] Scholar and undergraduate apprentice [at the Glasscock Center] made me realize that graduate school was no longer a necessity for me.” It was also during her time at the Glasscock Center that she connected with her current supervisor at Humanities Texas during a professional event hosted by the Glasscock Center. In the future, Kelsey plans to continue work for a few years and then go back to school to pursue a master’s in Integrated Marketing Communication.